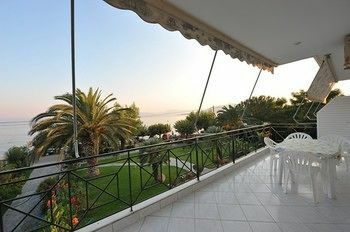 Pefki is one of the most beautiful and most developed tourist resorts of northern Evia. Irene apartment studios are located just 500 meters from the beach built on an amphitheater green land of 4 acres surrounded by olive trees.The owners have created a special environment for their guests in order to enjoy the spectacular view from the balconies and endless hours of enjoyment and relaxation. Distance to the Beach: ca 500mDistance to the Airport: ca 210km from Athens airportDistance from the nearest Village/town: ca 1,5km from PefkiAdditional information: Cleaning: dailyLinen Change: every 3 daysTowel Change: every 3 daysBeach description: small pebbleBus stop: opposite the hotelATM: ca 10km The images shown here serve to give a general impression of the hotel. 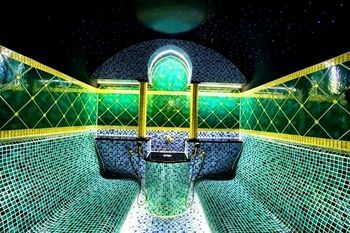 The facilities may be slightly different from these examples as well as the names of the room types. 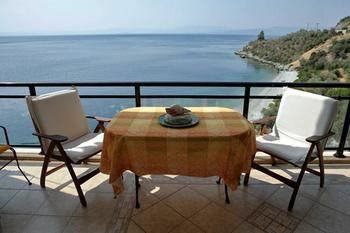 Kiapekos studios is located in a beautiful town in Northern Evia, the famous Edipsos and at a short distance from the city center, the beach and harbor.It has 27 apartments and rooms equipped with amenities to spend a relaxing holiday. Distance from the Beach: ca 30mDistance from the Airport: ca 300km (from El. Venizelos, Athens)Distance from the nearest village/town: ca 4kmAdditional information: Cleaning: 6 times per weekLinen Change: every 4 days Towel Change: dailyBeach description: The closest beaches are rocky with thermal water. Few kilometers far, there are wonderful sandy beaches.Bus stop: ca 500mATM: ca 200mThe images shown here serve to give a general impression of the hotel. The facilities may be slightly different from these examples as well as the names of the room types. 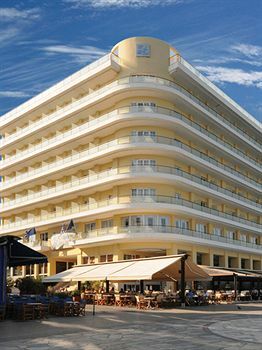 Just a few hours from Athens, in the lush surroundings of the island Evia, in the pine trees and overlooking the sea, a 5 acre site especially designed to meet even the most demanding visitor, hosts the Altamar Hotel.Its guests are welcomed to spend their most tranquil moments beside the pool and relax in the Altamar Pool Bar. The rooms have all the comfort one needs to spend the vacation he deserves.Distance to the Beach: ca500mDistance to the Airport: ca 210km from Athens airportDistance from the nearest village/town: ca10km (Istiaia town)Additional information: Cleaning: dailyLinen Change: every 3 daysTowel Change: every 3 daysBeach description: small pebbleBus stop: opposite the hotelATM: ca 10km The images shown here serve to give a general impression of the hotel. The facilities may be slightly different from these examples as well as the names of the room types. Built on a beautiful hill 400 m from the village port, the amphitheatrically styled hotel offers a view which is dominated by the gulf of Marmari’s blue horizon and its surrounding islands. Open from mid-April to the end of October, the resort provides the warm hospitality and comfort that attracts both foreign and Greek visitors alike.Marmari Bay Hotel is not only a place for people who love the sun, but also an oasis, far away from the inconvenient noise of the city. Here guests can sunbathe all day, dine outside on our restaurants veranda, have a drink at the pool bar or simply enjoy the sunset from the balcony. For those who wish for both quiet relaxation and entertainment, this resort guarantees a memorable vacation.Distance from the Beach: ca 300mDistance from the Airport:ca 50kmDistance from the nearest village/town: ca 500mAdditional information: Cleaning: dailyLinen Change: 3rd day of stayTowel Change: daily, if left on floor or showerBeach description: Bus stop: ca 100mATM: ca 600m The images shown here serve to give a general impression of the hotel. The facilities may be slightly different from these examples as well as the names of the room types. 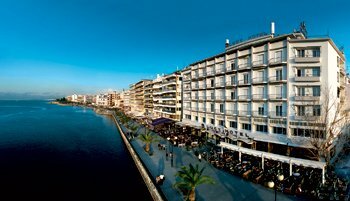 The Eviana Beach Hotel is 3 ***, center, on a sandy beach, next to the famous Island of Dreams and beside the busy tourist pedestrian Eretria with the many fish taverns, cafe and night clubs offered to nightlife. It is closer from the commercial center, 300 meters from the Archaeological Museum and just 250 meters from the port. The location of the hotel combines an idyllic location for refreshing walks, relaxation, swimming and nightlife or visits to the ancient city. 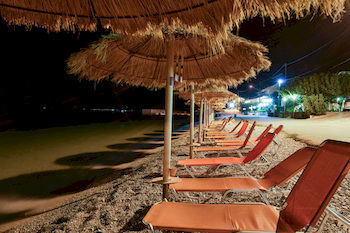 Distance from the Beach: next to the beachDistance from the Airport: ca 115km from Athens airportDistance from the nearest village/town: ca 400mAdditional information:Cleaning: dailyLinen Change: every 3 nightsTowel Change: every 2 daysBeach description: sandy beachBus stop: approx. 600mATM: approx. 600m The images shown here serve to give a general impression of the hotel. The facilities may be slightly different from these examples as well as the names of the room types. Page rendered in 0.4547 seconds using 2.22 MB (6 MB) of memory.